A fist of pain hit my gut, and I looked away before she saw the agony in my face. Why hadn’t anyone told me? I was 16 at the time, and a year prior I’d had an abortion. The lady at the clinic told me there was “just a blob of tissue” inside me. When I had my own children I wanted them to know the truth about the development and sanctity of unborn babies. I checked out books at the library on fetal development. I let my children hold a tiny model of a developing baby at a display at the fair. I wanted them to make better decisions than I had, to be a voice for life, and be able to counsel friends facing tough decisions—such as whether to carry a child when facing an unplanned pregnancy. It’s never too early to teach our children. 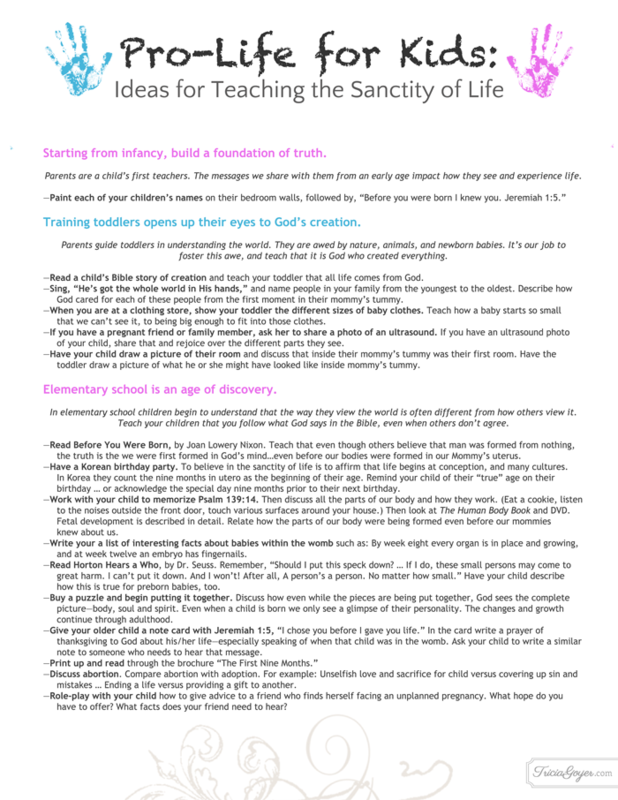 Here are numerous ideas for parents on how to teach children at each stage of development about the sanctity of pre-born life. Starting from infancy, build a foundation of truth. Training toddlers opens up their eyes to God’s creation. Parents guide toddlers in understanding the world. They are awed by nature, animals, and newborn babies. It’s our job to foster this awe, and teach that it is God who created everything. Read a child’s Bible story of creation and teach your toddler that all life comes from God. Sing, “He’s got the whole world in His hands,” and name people in your family from the youngest to the oldest. Describe how God cared for each of these people from the first moment in their mommy’s tummy. Next time you are at a clothing store, show your toddler the different sizes of baby clothes. Teach how a baby starts so small that we can’t see it, to being big enough to fit into those clothes. If you have a pregnant friend or family member, ask her to share a photo of an ultrasound. If you have an ultrasound photo of your child, share that and rejoice over the different parts they see. Have your child draw a picture of their room and discuss that inside their mommy’s tummy was their first room. Have the toddler draw a picture of what he or she might have looked like inside mommy’s tummy. Elementary school is an age of discovery. In elementary school children begin to understand that the way they view the world is often different from how others view it. Teach your children that you follow what God says in the Bible, even when others don’t agree. Read Before You Were Born, by Joan Lowery Nixon. The first line says, “Long before the rocks shook and pushed upward to become mountains, God dreamed of you.” Teach that even though others believe that man was formed from nothing, the truth is the we were first formed in God’s mind…even before our bodies were formed in our Mommy’s uterus. Have a Korean birthday party. To believe in the sanctity of life is to affirm that life begins at conception, and many cultures (including Korea) celebrate this in a special way. “My daughter has a Korean boy in her class who just had a birthday,” says Loring, a missionary mom in Uganda. “She learned in Korea they count the nine months in utero as the beginning of their age. So her friend just turned nine years old and nine months.”Remind your child of their “true” age on their birthday … or acknowledge the special day nine months prior to their next birthday. Work with your child to memorize Psalm 139:14: “Thank you for making me so wonderfully complex! Your workmanship is marvelous—how well I know it.” Then discuss all the parts of our body and how they work. (Eat a cookie, listen to the noises outside the front door, touch various surfaces around your house.) Then look at The Human Body Book and DVD.) Fetal development is described in detail. Relate how the parts of our body were already being formed even before our mommies knew about us. Write your a list of interesting facts about babies within the womb such as: By week eight every organ is in place and growing, and at week twelve an embryo has fingernails. Have your child describe how this is true for preborn babies, too. Buy a puzzle and begin putting it together. Discuss how even while the pieces are being put together, God sees the complete picture—body, soul and spirit. Even when a child is born we only see a glimpse of their personality. The changes and growth continue through adulthood. Give your older child a note card with Jeremiah 1:5, “I chose you before I gave you life.” In the card write a prayer of thanksgiving to God about his/her life—especially speaking of when that child was in the womb. Ask your child to write a similar note to someone who needs to hear that message. Discuss abortion. Compare abortion with adoption. For example: Unselfish love and sacrifice for child versus covering up sin and mistakes … Ending a life versus providing a gift to another. Role-play with your child how to give advice to a friend who finds herself facing an unplanned pregnancy. What hope do you have to offer? What facts does your friend need to hear? As you can see, a parent’s role transforms from introducing your children to their place in God’s creation, to helping them understand that what they believe can impact others. Pre-born life is important and it’s beautiful. Who better than children of all ages to acknowledge and proclaim that? 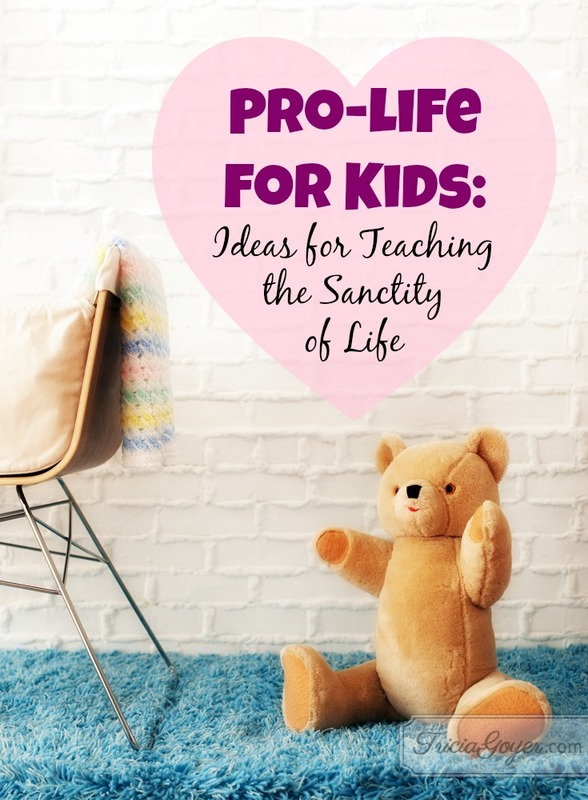 Download the printable and keep it handy for ideas how to teach your kids about the precious gift of life! Read the orginal post over at MomLifeToday.com!